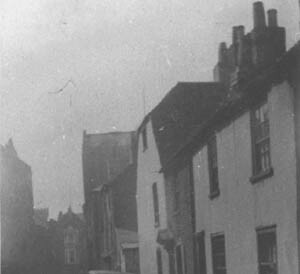 Streets in Portsea where prostitution was common place in Dickens’s era. At the time Queen Victoria came to the throne in 1837, the same year in which Dickens’s Oliver Twist began to be serialised in Bentley’s Miscellany, women, regardless of their social status, had limited choices in life: they were expected to marry, obey their husbands, and have children. As the century progressed, women became increasingly unhappy and began to challenge the ideals that kept them confined and controlled culminating in the campaign to gain votes for women, driven by the National Union of Women’s Suffrage Societies founded in 1897. The debates that took place in parliament, in literature and the Press and informed changes in the divorce, property, and custody laws governing women’s rights, became known as ‘The Woman Question’. Dickens played a public role in these debates, both directly and indirectly. Many of his novels include women who are easily identified as versions of the ‘angel in the house’; among these are Little Nell in The Old Curiosity Shop (1841); Esther Summerson in Bleak House (1852-3); Lucie Manette in A Tale of Two Cities (1859); and Amy Dorrit in Little Dorrit (1855-7). Dickens’s young sister-in-law, Mary Hogarth, who died at the age of seventeen in 1837 and for whom Dickens declared deep affection, is considered the inspiration behind a number of these domestic ‘angels’, including Little Nell, and Amy Dorrit. However, his relationship with his own angel in the house, his wife Catherine from whom he separated in May 1858, proved far more complicated. Over many years, public opinion, influenced strongly by Dickens’s own representation of Catherine, viewed her as a depressive and inadequate mother, a shadowy figure in her own household. More recently this has been challenged by new biographies and literary fictions based on her life. 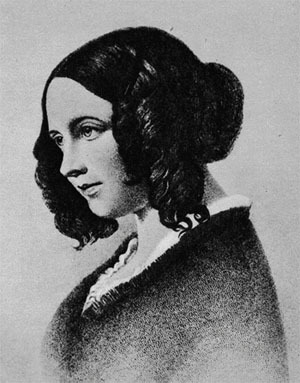 We have learned that, in spite of Dickens’s efforts to rewrite the past, seemingly much of the Dickenses’ married life had been relatively happy, and that Catherine Dickens was a woman of intelligence and resourcefulness. While Dickens may have had his own views on ideal femininity, he did not shy away from depicting women who fell short of this image, women who like Lady Dedlock in Bleak House were victims of pre-marital passion; like Nancy in Oliver Twist (1837-9), victims of poverty driven to crime and prostitution; or like Little Em’ly in David Copperfield (1849-50), seduced and abandoned. Dickens also took direct action. 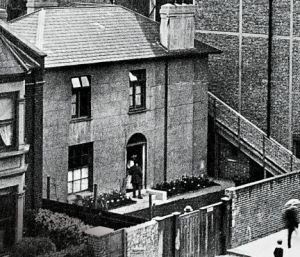 As a result of discussions with the philanthropist, Angela Burdett-Coutts, in 1847 Dickens set up Urania Cottage in London, a home for ‘homeless’ women, as Dickens termed it, in Lime Grove, Shepherd’s Bush. In 1849, Dickens wrote ‘An appeal to Fallen Women’, a leaflet designed for distribution to prostitutes taken into police custody, offering the cottage as an emotional and physical refuge. In Urania Cottage, such women were treated with sympathy, encouraged to reform and followed a strict regime which included prayer, education and the acquisition of practical skills in cooking, needlework and laundering, to prepare them for domestic service. Dickens’s involvement in the issue was timely: by the 1850s, prostitution had become the ‘Great Social Evil’. The general public worried about immorality, and considered streetwalkers a social nuisance that epitomised the problems produced by urbanisation. The Point area has contained numerous pubs and brothels for hundreds of years. (The latter have been removed in more recent years.) The picture above was painted just before Dickens was born by Thomas Rowlandson. 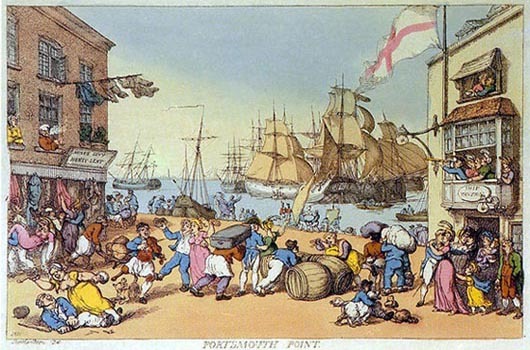 As concerns escalated, garrison and naval towns such as Portsmouth became the focus of such anxieties and women in these areas were increasingly scrutinised. Although condemned on moral grounds, it was accepted that, in such cities, vice was unavoidable and many landlords and brewers benefited from the trade. But there were serious concerns. In the report of a meeting to raise funds for a female penitentiary, published in the Hampshire Telegraph on the 22 October 1838, it was claimed that, ‘Of all the material evils by which society is disgraced, profligacy in Females is confessedly one of the most fatal. With other vices some virtues may be associated … but in Women, licentiousness involves the abandonment of all that is correct in principle, and desertion by all who are respectable in character’.The 1860s saw the introduction of a series of controversial Contagious Diseases Acts in 1864, 1866, and 1869 and an increase in ‘Lock Wards’ and ‘Lock Hospitals’ for the incarceration and treatment of women suspected of prostitution and infection. The problem lay in the fact that little separated casual prostitutes from the large number of the poorest women who eked out precarious livings. Although some became full time prostitutes, for many young poor working class women, prostitution was an acceptable temporary or transitional occupation which they carried out for a few years in their teens or early twenties. The demand for their services mostly came from the same social class and many were fully integrated within their working class communities whose notions of ‘respectability’ did not always concur with middle-class ideals. Problematically, prostitution, while subjecting them to the hazards of disease, alcoholism and insecurity, also offered even the poorest woman a degree of self-reliance, independence and financial well-being. 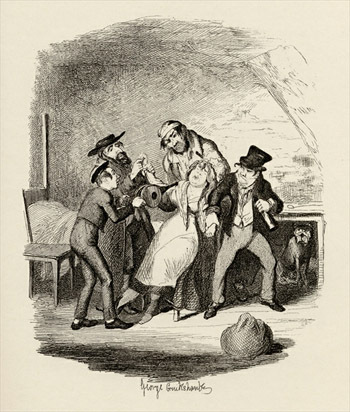 Dickens’s depiction of Nancy in Oliver Twist draws on some of the realities of the poor woman brought up in an amoral environment, while acknowledging a ‘goodness’ in her character that, in different circumstances, might have led to a very different life. Nancy in Oliver Twist. Illustration by George Cruikshank. 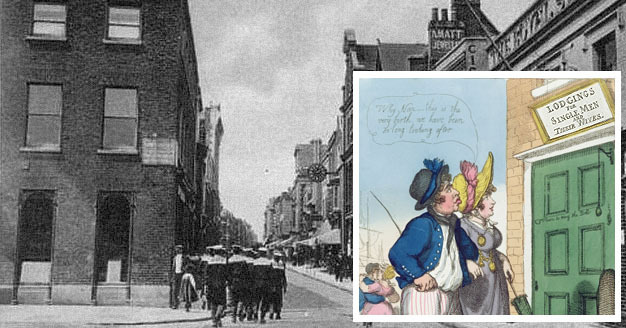 In Portsmouth, the number of prostitutes operating varied with the military and naval presence. In 1864, it was calculated that there were nearly two thousand prostitutes and over two hundred brothels. For the period from 1865 to 1870 there were between six hundred and a thousand so called common prostitutes who openly practised their trade and were ‘registered’ by the metropolitan police. These numbers took no account of the large numbers of clandestine prostitutes. These included factory or shop girls who supplemented their pay, young women or the wives of absent servicemen who supported their family. As in Dickens’s Urania Cottage, measures existed in Portsmouth to reform such ‘fallen women’. In 1831, a charitable penitentiary was set up in Spring Street, Landport. By 1841 some eighty ‘deluded daughters of Adam’ had been received into the house. Of these thirty-five had been placed into service, restored to friends or married whilst another twenty were either expelled or returned to their former life. In 1831, a charitable penitentiary was set up in Spring Street for prostitutes. She has 48 women at a time. She teaches those who are strong and able laundry work, others needlework. The women are most ignorant when they come. Only half can read or write…Many women leave before they are reformed…Most go into service of trade’s people…They have three services on a Sunday… prayers daily at 0700; religious books and tracts on Sundays; no light literature or newspapers at any time. Fathers, mothers and sisters are allowed to see them on Mondays. 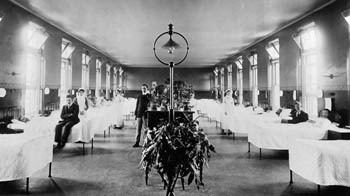 The Royal Portsmouth Hospital had a ‘Lock Ward’ for the treatment of prostitutes under the regulations governed by the Contagious Diseases Acts 1863 – 1886. The Contagious Diseases Acts empowered the Metropolitan police in eighteen garrison towns and ports to arrest any woman suspected of being a prostitute, subject her to a medical examination, and have her confined to a Lock Ward within a secure hospital if found to be affected. Libertarians and women’s leaders were outraged and a successful campaign was mounted, led by Josephine Butler of Liverpool and the Ladies National Association, which culminated in the Acts being abolished in 1886. Please return to the Portsmouth map to explore further. (If you are using a mobile device, return to the quick index page). Or you may like to read the book, Dickens and the Victorian City, written by Dr Brad Beaven and Dr Patricia Pullham at the University of Portsmouth.